There was already a good chance that the new Ford GT would be a rarity on any race track with a price starting around $400,000, but with 250 units planned for each model year, this car is hitting the market as an instant collectable. Because of this, the likelihood of seeing one duking it out on a road course with a Dodge Viper or a Chevrolet Corvette Z06 is slim to none so regardless of how incredible the new Blue Oval-clad supercar is as it rockets around the Nürburgring during internal testing, the low production ensures that the new GT will be more of a showpiece than a supercar that we might see at our local track day. The one good point for Ford Motor Company is that with only 250 units planned for each model year of the 2017 Ford GT, the car is going to be a guaranteed sales success. Unlike the Dodge Viper, which is constantly plagued with criticism over unsold units and low monthly sales regardless of how many the company sells, the Ford GT will almost certainly be sold out before one of them ever reaches a dealer lot. Between dealerships ordering them to serve as the centerpiece of their showroom and crazy-rich collectors laying down big money for a reservation, I wouldn’t be surprised if all 250 of them were basically sold in one day – or at most over the course of one month. In terms of sales, the 2017 Ford GT will be a total success. Everyone will talk about how gorgeous the car is and how amazing the EcoBoost engine is and they will all be right. 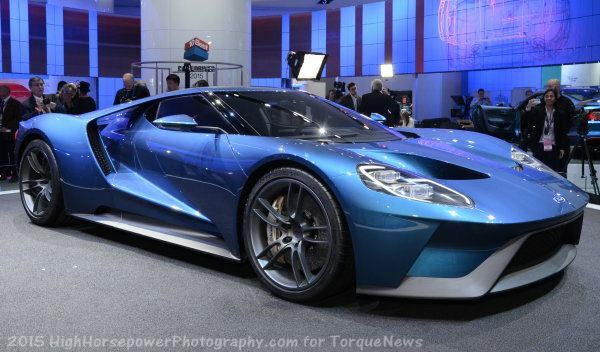 However, this new Ford GT is becoming less and less of what the Ford Racing world wanted each day. One problem that will plague many deep-pocketed prospective 2017 Ford GT buyers is that with 250 units planned for the entire world and more than 3,000 dealerships in the US alone, very few dealerships are going to get one of the new supercars. Even if you have a half million dollars to prepay your local dealership, there is no guarantee that they will get one. Because of this, those dealerships that do get their hands on one of the 2017 GT units will almost surely be looking to make a whole lot of money on it. Imagine being the only dealership in the state of California to get a Ford GT – are you going to sell it for MSRP or look to get the most money possible? Regardless of what you said, dealerships will look to make the most money possible. This will lead to what could be record setting markups. For years now, faithful Ford fans have been calling for a proper supercar – something to compete with the Chevrolet Corvette Z06 and the Dodge Viper. The Mustang Shelby GT500 has done a fine job of handing out straight-line beatings to all comers in the past few years, but that muscle car can’t compete with either of the American supercars on a track with turns. Ford fans wanted a 2-door, 2-seat sports car to battle the Corvette and Viper, and when the new GT debuted earlier this year at the Detroit Auto Show, it appeared as though that supercar had finally arrived. Sure, some were skeptical of Ford’s choice to go with a twin turbo V6, but with the lightweight construction and the mid-engine configuration, the 600+ horsepower EcoBoost should make the new GT one wicked fast car. However, when the news surfaced that the 2017 GT would cost upwards of $400k, it quickly become very clear that this was no Z06 or Viper competitor. Even though Ford hasn’t proven that they can compete with the American supercars, they went directly at the Italian supercar leaders, with the GT aimed at the likes of the Lamborghini Aventador. Unfortunately, while the 2017 Ford GT is beautiful and likely very fast on any track, it still leaves a gap in the lineup where a proper competitor for the Chevrolet Corvette and Dodge Viper would sit. There are plenty of videos showing the C7 Z06 and 5th gen Viper doing battle, but the likelihood of seeing the Ford GT included in the racing mix is looking worse every time new information pops up on the Blue Oval supercar. Finally, for those wondering, the news of the limited production numbers surfaced yesterday, so there is a good chance that this is not an April Fool’s Day joke.